Guess what arrived this week? When my husband Tom and I booked tickets to Hong Kong for next month, we took advantage of Cathay Pacific’s special Year of the Dragon fare, which included a free stuffed dragon. Pretty true to the ad, right? 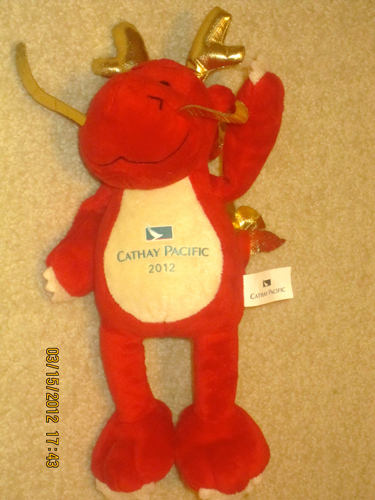 My two youngest kids were delighted to open the package on Monday and find this dragon. I thought it would be difficult for them to share (alas, Cathay only allowed one dragon per online reservation), but they’ve surprised me as one carries it around during the day and the other one shares a pillow with it at night. It’ll be hard to be away from the kids for a week in April, but knowing that they can picture Hong Kong through books I’ve read them–and now this dragon, which comes from the airline we’ll fly–makes it a little easier to get away. He looks adorable – and does he resembles Barney or am I imagining that? Now that you mention it, the one in the lower photo looks like him! Waaaaaaaaaaaaaa…. now I want one! There’s always Tao Bao! You never know! I do know… Ellen’s been scouring TaoBao since you first posted the picture. Wah! I’ll look on eBay here. They might only be available in the US…for now.